The Husband and I just back from a fantabulous weekend in New Orleans. Actually, now that we’ve been there and we’re super cool, we call it NOLA. Anyhow, NOLA was amazing. Between celebrating the wedding of our incredible friends, spending the weekend eating beignets and pralines, dancing our pants off at a blowout wedding party, and second-lining our way through the hotel, it was a pretty sweet time! Ever since we booked our tickets for NOLA I knew that I’d be making a praline ice cream. Upon arriving in NOLA, I decided to throw my New England charm out the window for an afternoon, and adopt a “local” accent. I marched my tuchas right up to the front desk and asked” Hey y’all, where are the best ‘prah-leens’ in town?” The Husband looked at me like I was nuts and then laughed in my face. What? Can’t a girl dream about being a Southern belle? Apparently not! 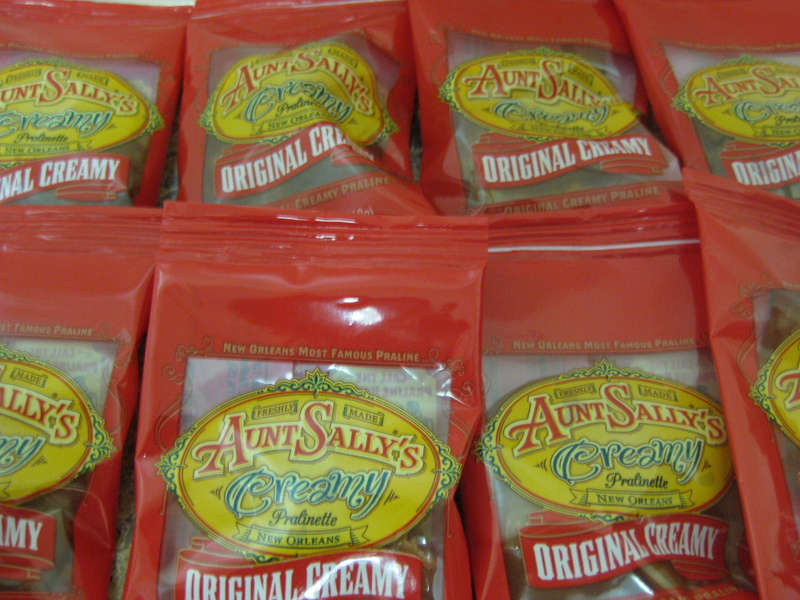 Aunt Sally's Pralines all lined up and ready to go! Despite my ridiculous sounding accent, I still managed to find the golden delicious treats. Though I’ve tried a few pralines in my day, I decided to make this ice cream out of Aunt Sallys Pralines. Or should I say “prah-leens”? Or “pray-leens”? Who knows. But what I do know is that they’re damn good. In the days of sailing vessels, a southern gentleman made business trips from New Orleans to Paris and returned with some delicious pralines, which he presented to the head cook of his plantation. By virtue of her excellent cooking, she prepared a confection that has lived through the ages. 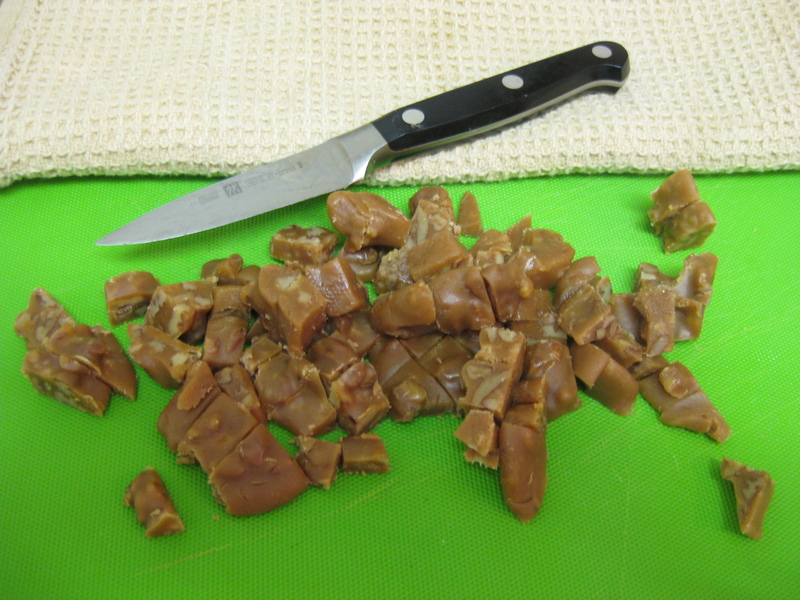 During the mid-1800’s, Entrepreneurial black women in New Orleans, who had very few opportunities to make extra money for their families, realized the popularity of the praline and found considerable success selling them on the streets, thus making the Praline synonymous with New Orleans and a delicious candy loved by everyone. Now that you all know where the praline came from, all that’s left is this ice cream recipe. Beware. It’s sweet. And addictive. Inspired by NOLA. Adapted from Dorie Greenspan’s Burnt Sugar Ice Cream recipe. Created by moi. Gently warm the milk, half-and-half, salt and vanilla bean paste in a pot on the stove top. Do not let the mixture boil. Remove from heat and cover so that it stays warm. Stir the sugar and water together in a medium heavy-bottomed saucepan. Place the pan over medium-low heat and cook until the sugar dissolves. The sugar will be very liquidy and then it will bubble rapidly (still white or clear in color) and eventually the water will boil off and it will return to clumps of crystalized white sugar. This is normal. 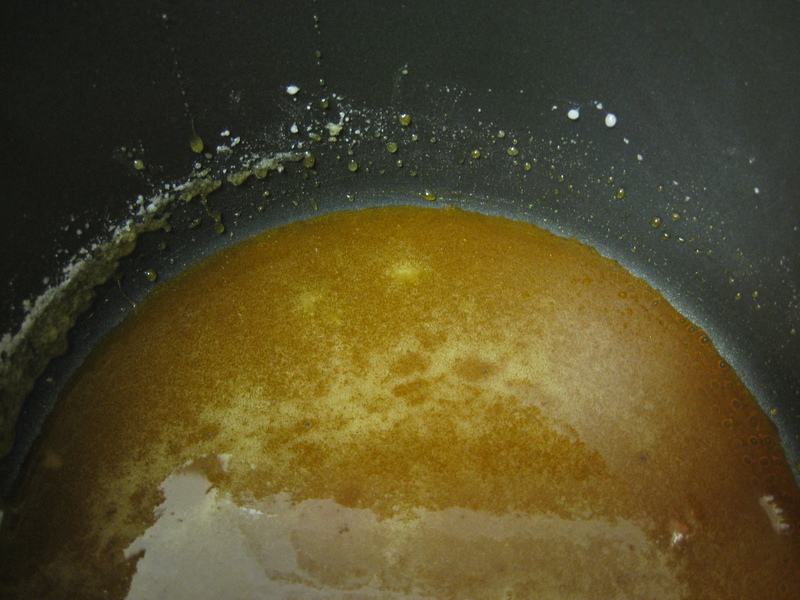 Slightly increase the heat and without stirring, let the sugar begin to caramelize. From time to time, brush down the sides of the pan with a wet pastry brush and swirl the pan. I was extremely cautious when making the caramel because the first time I did it, I turned around for 20 seconds, and the next thing I knew my caramel was smoking and burnt. So, on the second try, I watched the caramel like a hawk because it went from golden brown to dark amber in a nanosecond. But if you keep the sugar mixture on low heat the entire time it takes approximately 15 or so minutes for it to caramelize. Once the caramel is created, turn the stove top off, put on an oven mitt, step back, and pour the milk mixture into the caramel. 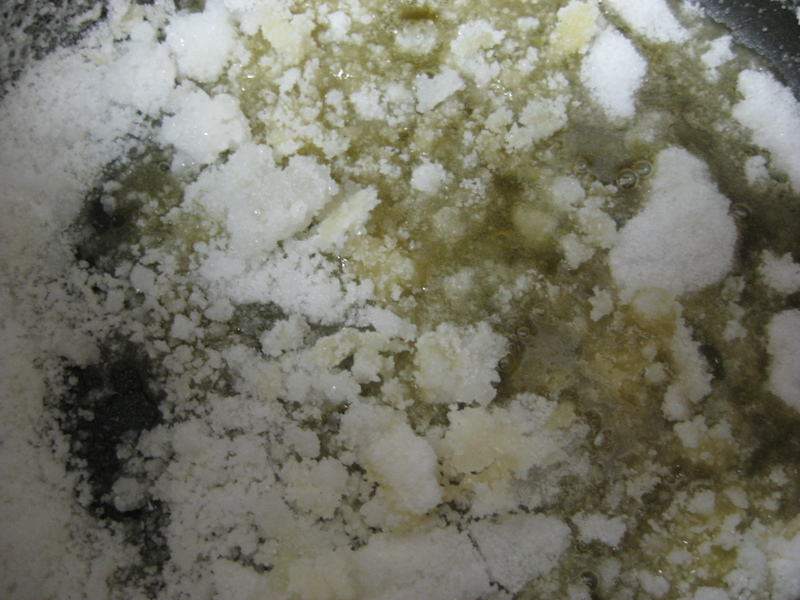 The mixture will smoke and bubble rapidly, and some of the sugar will clump together. Once mixed, turn the heat back on to low, and stir until the caramel cream ice cream is well blended. Let cool completely on the stove top and then refrigerate for at least two hours. Transfer to the bowl of an ice cream maker and churn according to the manufacturer’s instructions. 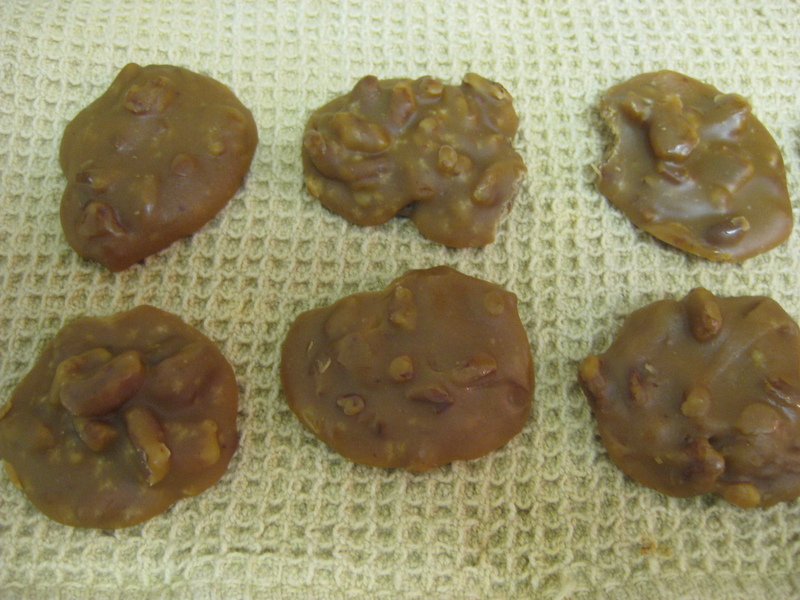 While the mixture is churning, chop the eight pralines into small chunks. Approximately five minutes before the mixture is done churning add the praline pieces slowly into the ice cream. Let churn for five more minutes and then transfer to a freezer safe container for two hours, or overnight, before serving. The Verdict: The Bees Knees! Truthfully, this was a really decadent ice cream. The caramel cream base was really smooth and sweet, but not overpowering. In fact, it mimicked the praline flavor quite well. The pralines themselves held up really well in the ice cream because they were soft and chewy, and so when frozen, they didn’t get hard as a rock. Instead they were chewy and delicious. The perfect combination. I highly recommend this flavor! Happy licking to y’all! Mrs. O! Thanks so much for your “southern hospitality” and don’t worry, I’m making some more NOLA-inspired ice cream flavors. Yum yum yum! is there any left?? this sounds amazing!!! want to hop on a plane and get the next flight to New Orleans. Love that googling for a great pralines and cream ice cream recipe brought me to your site! Love the post and cant wait to try the recipe.